Easily remove water from your sump pit using the Little Giant Pedestal Sump Pump. This pump features an extended body and adjustable vertical float to ensure safe and proper usage. Place this sturdy pump in your 13" diameter or larger sump basin, and connect it to a standard 115 volt outlet. The thermoplastic construction offers a corrosion and rust resistant chassis for the motor resting atop the pedestal. This pump is activated only when the float rises up the rod. The intake ports around the base of the pump allow water to be moved at a steady rate, for efficient removal, and the generous 7.5' cord offers versatility in placement. The 1/3 hp motor is the perfect size for your average water removal needs. The pump motor and bearings are designed to move only water, not fuel or chemicals, and the pedestal shape is formed to fit in most residential sump pits. This pump accepts 1 1/4" MNPT fittings. 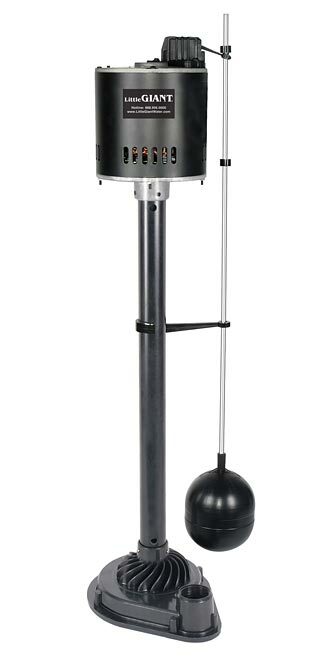 Keep your basement or sump pit free of excess water with this Pedestal Sump Pump. Two year limited warranty.